The movie starts in the time of King Arthur. My son wondered if this was the actual movie or another preview. It was the movie... It later jumps ahead 1,600 years. There is lots and lots of gore in the early scenes. More so than you'd expect from a movie about a bunch of fighting robots. The movie is 2 hours 30 minutes long. This is a long movie. Plan accordingly. I don't want to say the movie dragged on and it could have been shorter. It really needs the full length for the story they tell, if you don't mind lots of recollections of recreations of history in how the Transformers have been around for all time. However, I almost feel like there could have been two movies here, like Back to the Future 2 and 3. There is a natural breaking point between one sub-plot of the movie and another with plenty of time left for the second major battle. Mark Wahlberg takes the lead as keeper of the Transformers, hiding them away in a junkyard in the middle of nowhere since they've been deemed illegal everywhere but Cuba because of all the damage they've done. He ends up on a quest to find a magical staff after he's given an artifact while rescuing Isabela Moner's Izabella character from the T.R.F., a group who wants to destroy all the robots. 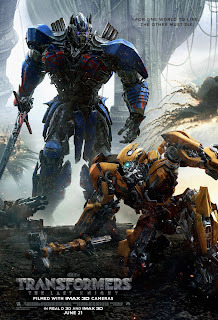 Autobot leader Optimus Prime returns a Nemesis Prime thanks to the guile of another from his homeland. There are some massive destructive battles of Autobots vs. Decepticon led by Megatron. Megatron has been recruited by the T.R.F. to help them get the staff, too. Mark's character Cade Yeager ends up partnering with an Oxford professor, Vivian Wembley and her 'stripper dress', played by Laura Haddock, thanks to Anthony Hopkins odd Sir Edmund Burton character. Burton has some good scenes especially when he goes to visit the Prime Minister of England and we learn of the real purpose of Stonehenge. As can probably be said of all the prior movies in the series, more battles happen, partnerships change, more battles happen, and the world is saved. Predictable ending to keep the franchise alive to fight another day. I've watched all the previous Transformer movies. I liked the first two and wasn't a fan of the third. I keep hearing mixed reviews about this one but will more than likely watch it when it comes out on DVD. My grandsons love watching the transformers. And they have lots of the transformer toys. I wonder why there would be a lot of cursing in a movie that is obviouosly aimed toward kids. Not a good idea. But then, at the end, I don't really know which is worse - all the cursing, or all the battles..